Citing security concerns, the CNRP backed away from its pledge to hold a mass rally at Phnom Penh’s Freedom Park on Sunday to mark the 25th anniversary of the Paris Peace Agreements, retreating instead to party headquarters with a few hundred supporters. As late as Friday, the opposition party was promising to draw thousands of people to the central Phnom Penh park on Sunday in defiance of a City Hall ban. CNRP lawmaker Mu Sochua said her party took the warning as a threat and backed off. In October last year, two opposition party lawmakers were dragged from their cars outside the National Assembly and savagely beaten during an anti-CNRP protest. 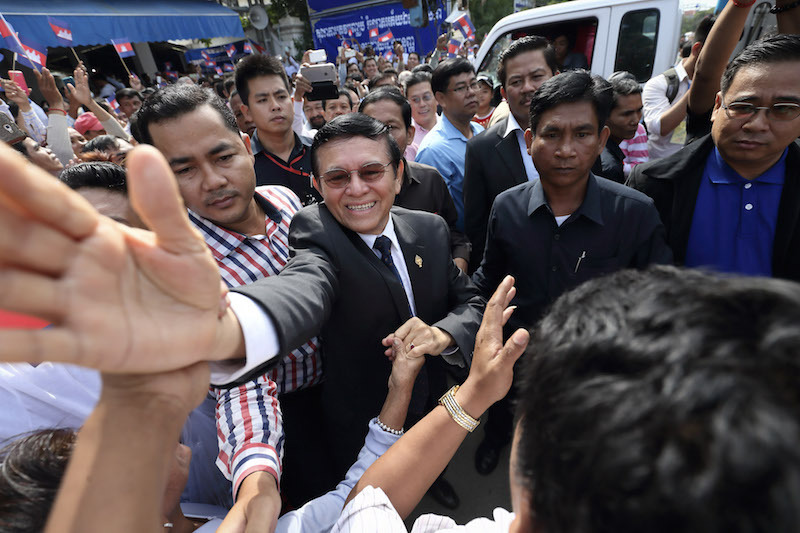 Three members of Prime Minister Hun Sen’s bodyguard unit were convicted of the attacks and given one-year prison terms, though rights groups say the courts blocked the prosecution’s attempts to find out whether orders had come from above. Ms. Sochua nonetheless called on Sunday’s smaller-than-planned rally at the CNRP headquarters a success and rejected the suggestion that the retreat from Freedom Park made the party look weak or indecisive. “It does not mean we do not speak out, but [that] we need to be more careful,” she said. The CNRP cited similar security concerns when it made an 11th hour decision to call off plans to end its current boycott of parliament and join a National Assembly session earlier this month. Outside party headquarters in Meanchey district on Sunday, hundreds of supporters choked off the northbound lanes of National Road 2 for most of the morning to hear from CNRP lawmakers, including acting party president Kem Sokha. Speaking from the back of a crane truck parked in the middle of the road, Ms. Sochua told the crowd that the 1991 Paris Peace Agreements, meant to set a then-war-torn country on the road to democracy, were still far from realized. “There are still serious violations of human rights and democratic principles,” she added. Twenty-five years on, the agreements remain a political lightning rod in the country. The opposition and its supporters say the government has never lived up to the deal. The CPP, which lost the 1993 elections set up by the agreements but refused to give up power, says the deal pales in importance next to the amnesty it later negotiated with Khmer Rouge rebels.